So you’ve just fallen madly in love with a dress you met online. It’s gorgeous! You love it! You might have to buy it, but you’re not sure! You’d like some time to think about it, but it’s a buy it now, and there’s not a moment to lose. As you speed-read through the description, you imagine there’s someone else on the other side of the world doing exactly the same. Only they’re one step ahead of you, and any second, that dress you’re pretty sure you might want will be theirs forever. 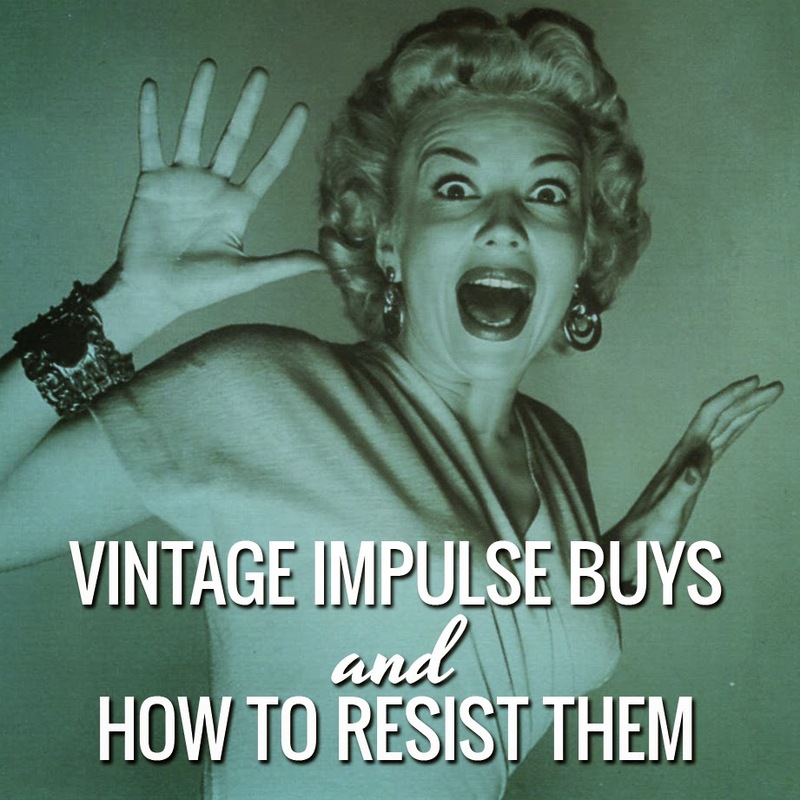 It’s hard to think straight under these conditions… But these days, a huge part of vintage buying is impulse buying. And sadly, the usual shopping rules don’t apply to vintage. Questions like “Does it fit?” and “Can I afford it right now?” aren’t always applicable when something amazing comes up. This may be your only chance! So how do you turn impulse buying into smart shopping? Here’s some creative ways to test your true feelings before pushing the button. This is a great way to figure out your feelings pretty quickly. Imagine you’re at a party, and another girl walks in wearing the outfit. It helps to imagine this other girl is maybe someone you don’t like very much. So how do you feel? Are you sick with remorse and a tiny bit of jealousy? Or do you feel smug because you know they paid too much? Either way, the ‘imaginary party’ can be a useful exercise. Sure, that outfit looks amazing when it’s beautifully pressed on a mannequin, but it’s not going to look like that all the time. Imagine it all wrinkled and draped over a chair in your bedroom. Or think about trying to stuff it into an already overstuffed closet. It's enough to make any vintage lover think twice. Just like old cars, vintage clothing needs maintenance too. At some point, hems come down, buttons fall off and holes need fixing… Do you love the outfit enough put the time in when these issues arise? Beautiful loungewear that’s so expensive, you’d be scared to wear it. Fancy daywear only appropriate for attending horse racing events. Designer wool coats that are impractical for Australian conditions. Add up the cost of the item plus shipping. If it was in front of you in a real store, would you think it was a good deal? If you really can’t decide, then try the one-hour test. Step away from the computer and do something else. If you can’t stop thinking about the outfit, you’ll know you’re really in love. And if the listing is still there when you get back, you’ll know it was meant to be. Such great advice! I am so weak where shopping is involved but am going to try to remember these tips and hopefully find a shred of willpower to resist! Especially with upcoming vacations to save for! Thanks Elisa! Nothing wrong with impulse buying now and then, but vacations are better! So true! If you've already got plenty of "nice" things, you should only buy AMAZING things! This is such a great topic! I love your tips. It really helps put things in perspective. I think a lot of us vintage-wearers feel obligated at times to "rescue" vintage by buying it, even though we don't NEED it or LOVE it.